Cancer Research Catalyst’s Behind the Scenes series provides an inside look at the planning and development of the AACR’s Annual Meeting, a must-attend event for cancer researchers. Read other posts in the series. Welcome back to our Behind the Scenes series. In addition to providing a forum for attendees to learn, network, and share information and ideas, the Annual Meeting presents a valuable opportunity for the AACR to recognize our research grant recipients, who range from promising early-career investigators to established researchers, and to honor researchers who have made significant contributions to the cancer research enterprise. This aspect of the meeting is managed by the AACR’s Scientific Review and Grants Administration Department (SRGA), led by Pat Morin, PhD. The department, which consists of 14 staff members, also coordinates programming related to Stand Up To Cancer (SU2C) and the AACR’s Associate Member Council (AMC). Unsurprisingly, planning begins far in advance. 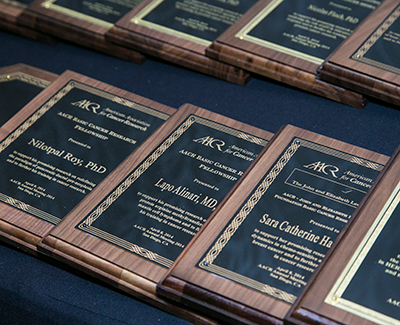 Plaques lined up at the grantee dinner during the AACR Annual Meeting 2014. SRGA also manages the selection process for the 15 scientific achievement awards given at the Annual Meeting and organizes a reception recognizing the awardees. Most of the award recipients present special lectures throughout the meeting, which SRGA coordinates as well. 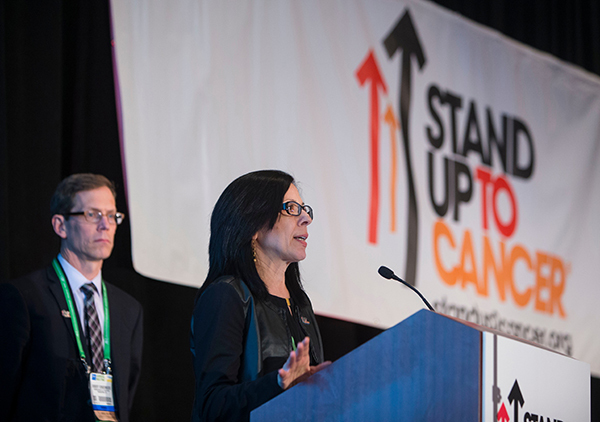 Elizabeth Jaffee, MD, leader of the SU2C-The Lustgarten Foundation Pancreatic Cancer Convergence Dream Team, speaks during last year’s SU2C Dream Team announcement at the AACR Annual Meeting. With her is the Team’s co-leader, Robert Vonderheide, MD, DPhil. Finally, SRGA coordinates a variety of AMC-organized programming for early-career investigators, including Professional Advancement Sessions, which rotate topics every year, and more informal networking and discussion sessions, which take place in the Associate Member Resource and Career Center (AMRC) in AACRcentral of the Exhibit Hall. All of these sessions are just a few examples of the many ways the AACR supports early-career investigators. As a cancer researcher who regularly attended the Annual Meeting before joining the AACR team, Morin says the meeting is a great opportunity to meet colleagues and establish new collaborations. As always, attendees can also expect to learn about great science and exciting, innovative trials.